If using classic crust: Heat oven to 425°F. Spray or grease 12-inch pizza pan or 13x9-inch pan. Unroll dough in pan. Starting at center, press out dough to edge of pan. If using thin crust: Heat oven to 400°F. Spray or grease 15x10-inch or larger dark or nonstick cookie sheet. Unroll dough on cookie sheet. Starting at center, press dough into 15x10-inch rectangle. Sprinkle dough with Parmesan cheese and basil. Top with provolone, Cheddar and Monterey Jack cheeses. Drop pasta sauce by spoonfuls over cheese. Bake classic crust 12 to 18 minutes, thin crust 10 to 14 minutes, or until crust is deep golden brown. Cut into 4 servings. 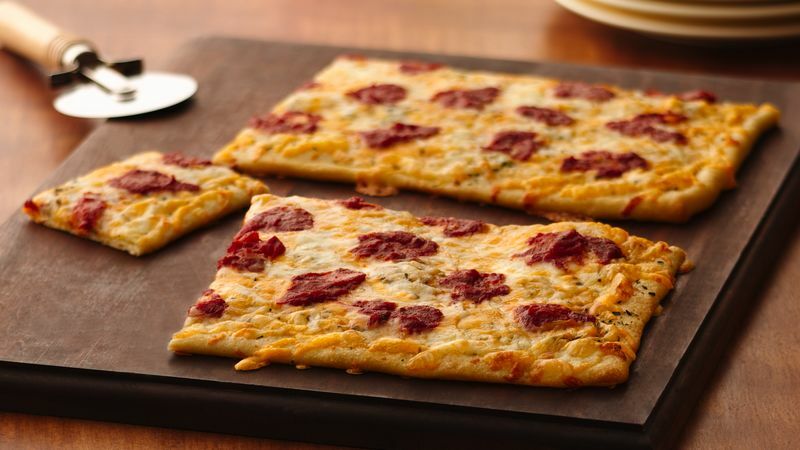 Tip if using classic crust: For a crispier crust, prebake crust 7 to 9 minutes or until light golden brown, then add toppings; bake pizza 12 to 18 minutes.